Writing topic – Does setting matter? In the wake of international blockbusters like The Da Vinci Code and The Girl with the Dragon Tattoo, I’ve been thinking, does setting matter? Do novels need to cover sweeping areas of the world, like vast portions of Europe (as both of the aforementioned novels do) and do so in mindboggling detail to hold a readers interest? Then I think of Faulkner and Eudora Welty, who both focus on the simple worlds of the Deep South and then I think no, it’s the story that matters. My latest thriller, The Brink, takes readers on a race from the wilderness of northern Mexico, to the center of power in Washington, D.C. The settings include the US-Mexico border where a firefight takes place as the hero and heroine try to cross the Rio Grande on a hand-powered ferry, and a D.C. bar I used to frequent in my mid-20s where our dynamic duo hold up for the night. Here is your chance to chime in, dear reader. Like clothes making the man (a cliché I don’t believe in), do settings make the story? And does the author need to have intimate knowledge of that place? Or like JK Rowling, do writers only need to depend upon a dynamic imagination to paint the setting for their reader? To the keyboard, dear reader! Mark Fadden readily admits his new novel, The Brink, could be the most controversial book of 2010. Not only does it feature a lost Constitution article, it uses real-world economic numbers to weave an intricate conspiracy tale that takes up where the recent financial meltdown left off. “Great fiction should inspire us to challenge the status quo,” Fadden said, “especially when the status quo involves our country’s truly dangerous financial situation.” It is this dangerous financial situation that becomes the focus of the story after fugitive lawman Danny Cavanaugh helps a woman running for her life, only to get sucked into a secret society’s plot to create financial Armageddon. The Brink is Fadden’s third novel and is a continuation of his first novel, Five Days in Dallas. Published in 2003, Five Days in Dallas received critical acclaim and Fadden himself was even called a “masterful storyteller” by a Writer’s Digest reviewer. Fadden then began working on the follow-up in 2006, which eventually became The Brink. His agent, Tris Coburn, shopped it around to several publishing houses in 2009, but couldn’t find it a home. Undeterred, Fadden decided to publish it with iUniverse, the world’s largest independent publisher. “It’s been quite a journey since I began writing in 2001. It took a long time just to find an agent who believed in me enough to pound the pavement with my manuscripts. Now, with the economy the way it is, the big publishing houses are being very conservative with what they will greenlight. But it’s great that there’s an outlet for people to publish something that they believe in.” With Fadden winning both the Editor’s Choice Award, which is only awarded to the top 10 percent of the 5,000 books iUniverse publishes annually, and the Rising Star Award, which is only awarded to the top 2 percent and will therefore be presented to national, regional and local booksellers as part of a nationwide sales campaign, it seems that he is right to believe in The Brink. 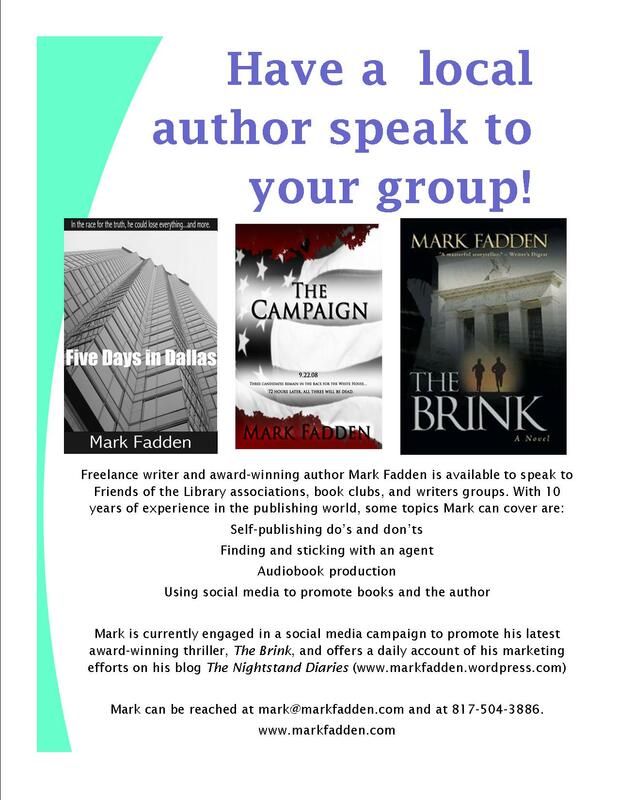 Starting in the Dallas/Fort Worth area where he lives, Fadden will conduct a book tour promoting The Brink this summer. Readers can log on to markfadden.com for tour dates and locations. The Brink is available in hardcover and paperback at most major book stores and online booksellers. The eBook format will be released this summer. The first 22 pages can also be read at markfadden.com. Mark Fadden readily admits his new novel, The Brink, could be the most controversial book of 2010. Not only does it feature a lost Constitution article, it uses real-world economic numbers to weave an intricate conspiracy tale that takes up where the recent financial meltdown left off. “Great fiction should inspire us to challenge the status quo,” Fadden said, “especially when the status quo involves our country’s truly dangerous financial situation.” It is this dangerous financial situation, which Fadden spent years researching, that becomes the focus of the story after fugitive lawman Danny Cavanaugh helps a woman running for her life, only to get sucked into a secret society’s plot to create financial Armageddon. 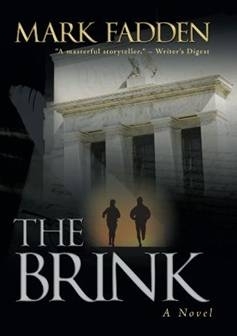 Fadden will be signing copies of The Brink on Saturday, August 7, 2010 from 11am to 1 pm at The Book Case, located at 109 N Main Street in Weatherford. Fadden will also be a guest on QXFM’s Books n’ Authors show on Saturday, August 7, 2010. The show will be broadcast at 10:00am on 89.5 KYQX and 88.5 KMQX radio, and on the Internet at www.qxfm.com. Again, this is supposed to be an interactive blog, so your thoughts (positive and negative) are highly sought after. This one’s for the mystery/thriller/detective writers. Most of the manuals out there say, “write what you know.” But I’m a firm believer in “know what you write.” For instance, I’m sure all the thriller and mystery writers are innocent of murder, yet they conjure up some of the goriest murder scenes humanly imaginable. How? While they didn’t kill someone, they imagine how to do it. They know what they write. But 9 times out of 10, they talked to someone who has seen grisly murder scenes to suspend their readers disbelief. So, how to do that? Simple. Talk to your friendly neighborhood police officer. I was talking to a police officer today that knew I was a writer. He said he has always wanted to write a novel about what he’s seen over his 25 year career (It’s an item on his bucket list). Right there is a fountain of information for me and I am a resource for him about the writing process. Win-win, right? Every city and town has a police department. Chances are there’s a veteran there who has some great stories to inspire your writing. Go down to the department and see if you can do a “ride-along” with one of the officers. If they don’t offer that, see if you can join a civilian group that supports the police department. It will take a little time to network, but sooner or later you’ll be sharing war stories over a beer with one of your city’s finest that could be the plot to your next masterpiece. What’s a better keyword for people to find a novel in which America’s staggering national debt is used to produce global financial Armageddon: ‘national debt’ or ‘financial Armageddon’? (BTW, if you’re new to this blog, that’s the gist of the plot from my latest thriller, The Brink) Do you think more people are searching for the term ‘national debt’ or ‘financial Armageddon’ these days? Keywords continue to mystify me, as they do most people. There’s an art to picking them and timing seems to be the most important part of using keywords. How do you use keywords? We’d all love to know in the comment section. While I created this blog to discuss the adventures of trying to market a book, there’s been some interest in also talking about the writing side of producing a book as well. So, we’re starting a new format here at ND that might just inspire some more interaction. ‘Cause you can’t market something that ain’t been written down, right? Could these individual states go to war? Could this spark a war with the other countries that we owe money to, seeing that with no more federal government, there’s no one to pay our massive bills. What if it happened and then one person tried to make the USA come together again? What factions would want to stop him or her? As far as settings go, would an end to the federal govt mean a beginning of total societal chaos? Would it be like the post-apocalyptic world in Cormac McCarthy’s The Road? Or would it be business as usual? Thoughts? Opinions? Suggestions? Comments? Let’s bring it people! Besides the notion that based on that info, I should change the topic of this blog to “ebook” marketing, rather than “book” marketing, what does the notion of ebooks being the wave of the future mean for our book marketing efforts. Should we stop promoting the hardcovers and paperbacks? Should we even do signings in stores anymore? Or should we concentrate all of our marketing efforts for the ebook crowd? Could there be a way to “sign” an ebook? Or maybe make a video intro for an ebook made by the author that readers could watch before reading the ebook? Tonight’s topics are like Mike Tyson giving you the one two punch and then chomping on your ear for a bit, huh? I told you they’d be doozies.